From early on in Lucidity’s road map, the directors felt it was key to ensure that we can automate the deployment of services and provide our customers the ability to self manage day to day IT operations like creating new users or assigning email aliases and applications. In order to effectively scale our organisation, IT operations had to be executed in a uniform manner for us to manage growth effectively without having to continually employ engineering resource to do manual and repetitive tasks. 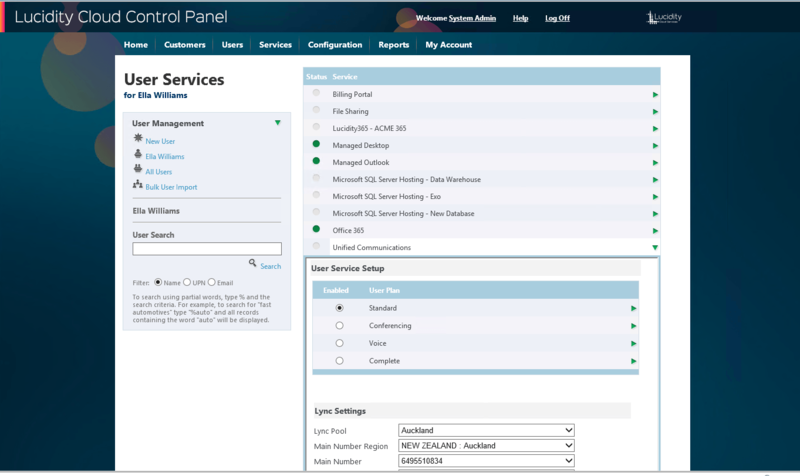 Lucidity deployed a product at the time called EMS Cortex to provide our customers a central control panel to manage provisioning activities. Lucidity have worked closely with the vendor (now Automate101) to customise the solution for our customers in NZ to put a lot of the day to day management and user reporting from the platform directly into the hands of our customer administrators. This approach dramatically reduces calls to our help desk around password management, new user setup and application assignment and ensures customers can quickly action changes as they happen in their business. Another key part of providing visibility to our customers is our Lucidity Customer Portal. This platform allows our customers to sign in and see their Invoices as well as a detailed breakdown of all their services by location, or even by user. 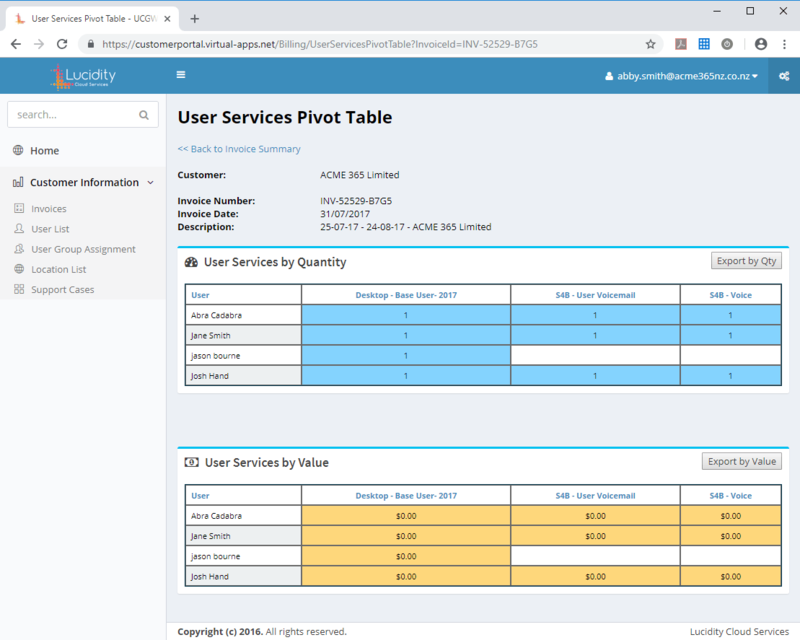 Our pivot table reports show all users within the business with a table of all their services and the individual costs of the services, so our customers can see cost breakdown at an individual user level, allowing a customer to make key decisions around which services are assigned to which users within their business. Our voice customers can see detailed information about their phone calls, and drill right down to a particular user to evaluate phone usage and cost. Finance teams can see the breakdown of services across multiple locations. We can work with your particular finance requirements to enable tagging of codes and cost centres to all hosted services as well as providing you downloadable reports on who has consumed what services within a month. 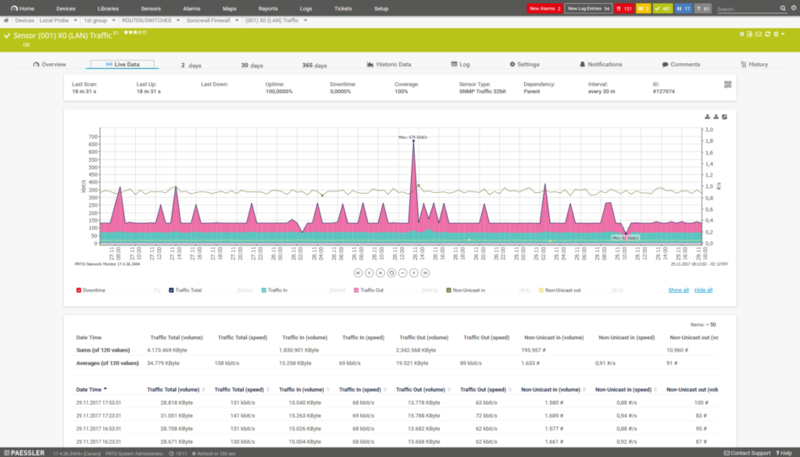 Lucidity use the leading monitoring tool PRTG product to manage the health of all our customer network connections. Customers can sign in to their own login in and immediately see the health of all their network services. Email and SMS alerts can be configured to send notifications to key customer administrators if there are any network issues present, allowing for fast troubleshooting and issue resolution. Lucidity engineering run these same systems and proactively monitor the health of all our customer connections. This allows us to see any patterns across customer connections to quickly pinpoint the source of any issues, whether it be geographical, or with a specific vendor.